Former Head of State, Rtd. 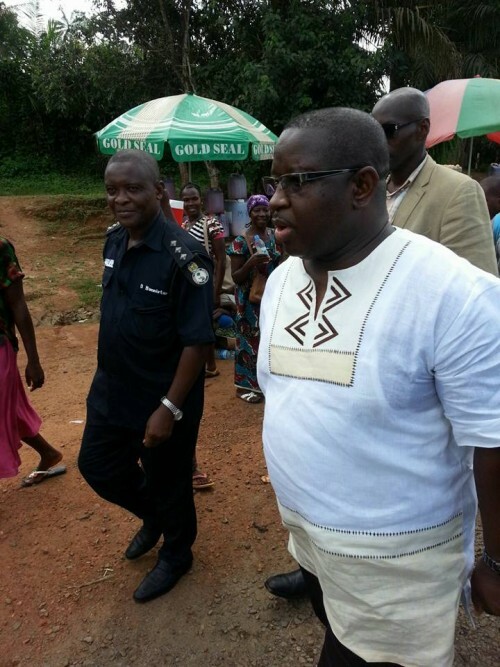 Brig Julius Maada Bio has started his social mobilisation tour on Monday 19th October 2015. Rtd. Brig. Bio started his tour with a visit to Kambia District. Respecting traditional authorities, Bio paid a courtesy call on Paramount Chief Bai Bubu Angbak. He declared that he was in Kambia to add his voice to the growing call for all Sierra Leoneans not to relent in the fight against the Ebola Virus Disease. 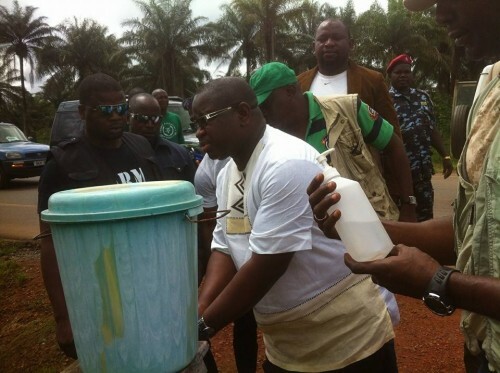 Bio thanked the Paramount Chief and elders for assisting the government and other partners in the fight against Ebola. He also expressed condolences for the death of many people in the district and country as a whole. In responding, the Paramount Chief thanked Bio for his timely visit to the district and for his contributions towards national efforts in eradicating Ebola. Maada Bio later visited the Kambia District Ebola Centre where he was briefed by Dr. Alfred Kamara on the district response to Ebola. Dr. Alfred Kamara Maada Bio and entourage that the district has taken ownership of the fight against Ebola and revealed that the MOU the district signed with neighbouring Guinea has also led to community ownership of the fight. Dr. Alfred Kamara also gave an up-to-date statistics of the Ebola cases, deaths and survivors in the district. Bio thanked him and his team for their sacrifices, professionalism and national service to ending the Ebola Virus Disease. 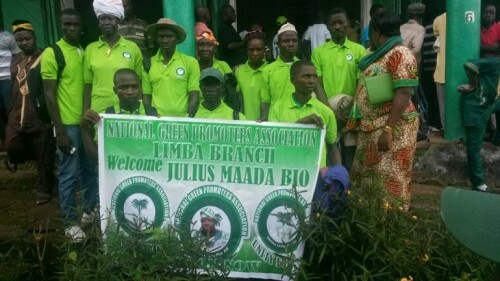 Later, at the SLPP party office in Kambia, Julius Maada Bio addressed a large crowd, where he told his audience that he was in Kambia to contribute towards the social mobilisation efforts of the government. He told the crowd that he was just adding his voice to the messages they have received from government and other agencies, that we are still not out of the woods yet so there should be no complacency. Bio said that the country has come a long way in the fight against Ebola and thanked all those who contributed in various sensitization efforts in communities and chiefdoms. He also expressed condolences to the families who lost loved ones. There were also many speakers who praised Maada Bio for his visit and interventions in the fight against Ebola, recollecting his donation of rice and other food items to the district at the peak of the Ebola virus. The next stop of the tour was Port Loko district where he also met with officials of the District Ebola Response Team. Officials of the District Ebola Response Team gave a report of the Ebola situation in the district and what they have been able to do in tackling the disease. In response, Bio thanked officials and the health workers for their continued efforts to defeat the virus. 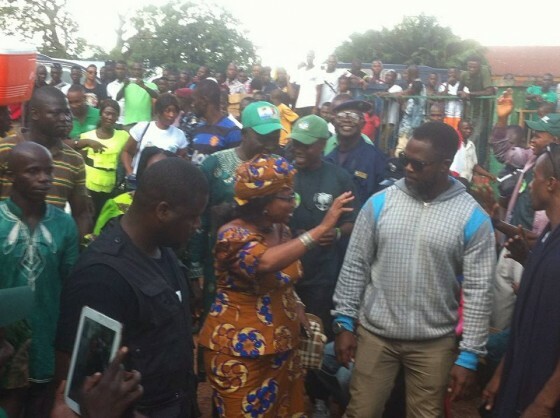 In Port Loko, Julius Maada Bio also held a meeting at the SLPP district office where he declared that the theme for his social mobilsation tour is “Paopa Ebola for don”. Addressing a huge crowd, Bio thanked the people of Port Loko for uniting against the common enemy which is Ebola. Like in Kambia, he also told stakeholders at the meeting that everyone should work towards maintaining the Zero cases. Other speakers at the meeting included Dr. Kadie Sesay (Photo) and Dr. Abass Bundu. From Port Loko, Bio and entourage left for Makeni where they were welcomed into the district by hundreds of jubilant youths. He spent the night in Makeni and will continue his tour on Tuesday, 20th October, 2015. Also, contrary to social media reports that Julius Maada Bio has not been granted a clearance for his tour, the Inspector General of Police has issued a directive dated 19/10/15 to all Regional Commanders informing them that Julius Maada Bio will be embarking on a nationwide ebola sensitization tour, and that the usual courtesies and security coverage must be accorded to him and his team. This is a report by the Julius Maada Bio Media and Communications Team.